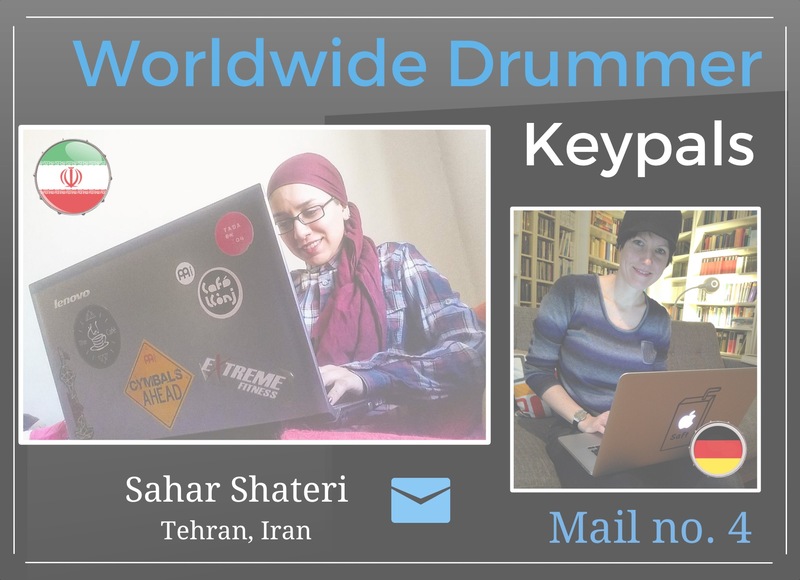 Wouldn’t you have been curious too after Sahar’s first e-mail response? 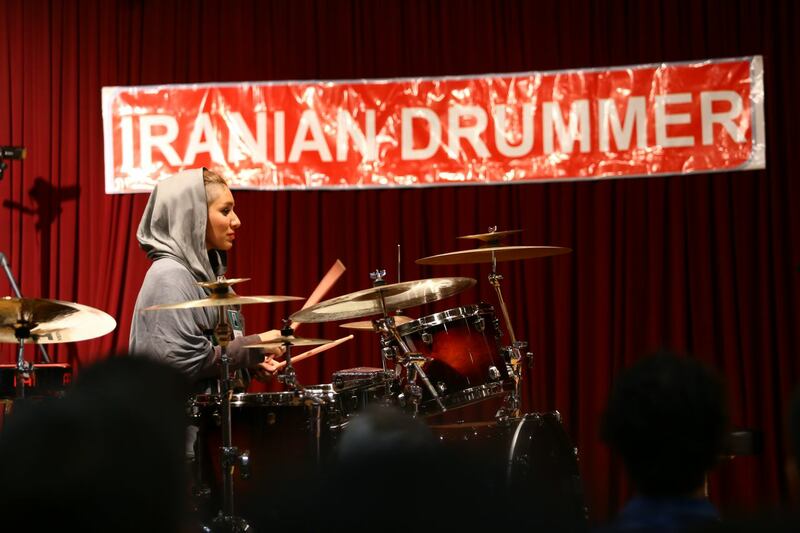 I was and that’s why I wrote her back some questions about the life of a female drummer in Iran. it’s been a while. Sometimes life gets in the middle of everything. 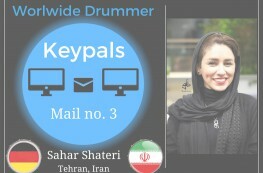 Thank you so much for your extensive reply, thanks for shining a light on Iran. I do hope I’ll get to visit some day. It all sounds very interesting for sure. Speaking of visiting, you didn’t miss much at the Musikmesse. 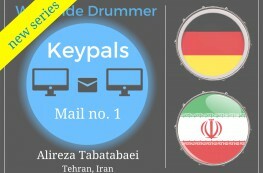 I am sure Alireza Tabatabaei already told you about his travels to Germany. Unfortunately we missed eachother in Frankfurt. But I bumped into Jost Nickel as you already know from my video I guess. 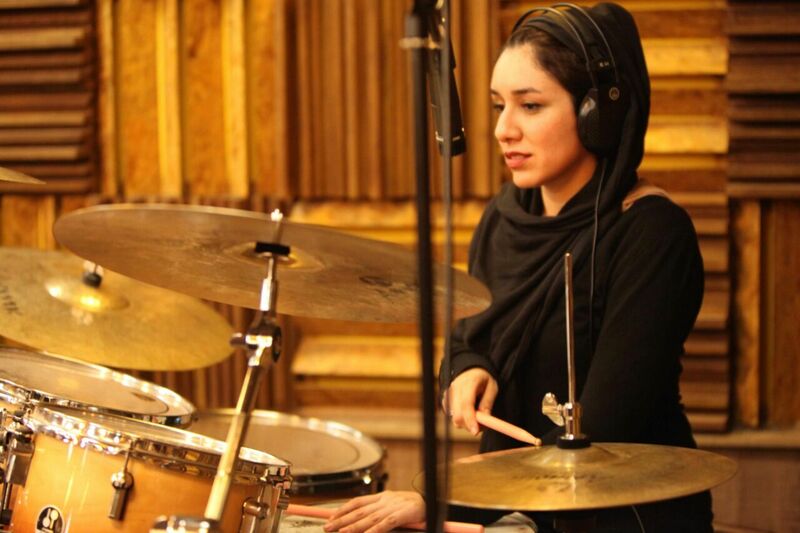 So you are a professional drummer in Iran. That’s very cool. Thanks to your parents, friends and your music teachers! You must be an inspiration to many girls in your country. You wrote that you play in different bands. Please tell me more about that. What kind of bands? Cover bands? Original bands? Mixed bands or also all-girl bands? Are there videos on the internet? How often do you perform and where? And do you make enought money through performing or do you also need to teach? While we are at it, if you don’t own an acoustic drum set just yet, how does that work when you have a gig? What kind of drums and which cymbals are you planning to buy? What’s your dream set-up at the moment? How do you make your choice? Do you visit different music stores? Let me know something about your practice routine. You practice on a V-Drum, how exactly? It seems that you really do a lot of playalongs. Are you more of a drummer, who plays from the heart with fresh ideas opposed to a very technical, chops-oriented drummer? In other words, besides playalongs, what do you practice? Last but not least the tonbak. I had to look it up. It looks like a giant jar. Do you still play? Is it difficult to play? Do you have a picture of yourself playing the tonbak? This much for today. I’ve got to run. I’m so sorry for the delay. As you already said, sometimes life’s getting in a middle of everything, and you must handle so many things together in a minute. And by the way, you are very welcome. We definitely are looking so forward to seeing you someday here with us in Tehran. 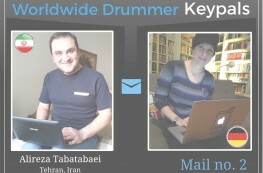 Yes, Mr. Tabatabaei told me about Musikmesse. He also said that you missed each other, and didn’t have a chance to meet. But I really wish I had been there, and hopefully, fingers crossed, I’ll be there next year. And yes I saw your photos and videos from there and from Jost Nickel . 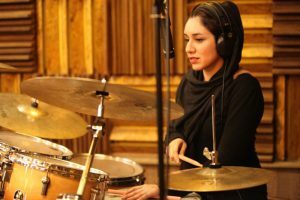 Ok. Well, yes as I said in my previous e-mail, I really should thank my parents and music teachers, especially Mr. Tabatabaei for encouraging me to do what I love and follow my dream as being a professional drummer. Yes, I already am playing in different bands. I think they are five of them, if I counted right. LOL. Most of them are all-girl bands. Because it’s much easier to work with and to perform. 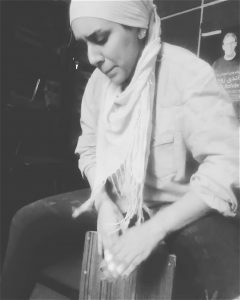 When you’re playing with a female music band, almost all of them are cover bands which means they are covering mostly old Iranian songs, that people usually know the lyrics and have memories with them. But I also am working with one or two bands that are included of both female and male musicians. About the videos: no unfortunately I don’t have any videos of me playing in those bands on the internet. And about the concerts and performances: well, it depends actually. I can’t exactly say how many concerts or performances we have for example in a month, because sometimes it’s more sometimes less. Sometimes we may have a concert for charity, sometimes it’s just a concert, just like other ones. It all depends. And besides, for I’m playing in different bands, it all depends on how they organize and plan for their performances. However with all these things, and all these performances, unfortunately it doesn’t make enough money for me for living. So I definitely must have a second job, as I already do have. Thus for sure, having a second job, makes things a little bit complicated. It makes it a little harder to have time for practicing and make a schedule for having both my job and my practices with different bands. But as French people say: C’est La Vie So I’m going for it and try my best to handle it in the best way that I can . Ok. Yes unfortunately at the moment I don’t have my own acoustic set of drums. So if I have any performances my drummer friends always help me out . Well, well, well … I’m planning to buy either a pack of Meinl Byzance cymbals, maybe Benny Greb signature, or Zildjian K series. Because both have a kind of dark sound which I love the most. And about my dream set of drums. I love Mapex drums. So … I already saw one Mapex Armory with olive green color – I REALLYYY LOVE IT and it sounds awesome. There’s also one Mapex Saturn set which is so cool. I prefer a kick drum with size 18″ but both of these sets have a kick size 22″. Nonetheless I love them, they sound cool. So hopefully I’ll get one of them soon. But, but, but … my first and most important dream set of drums is DW, which is so expensive and hard to find here. Well, about my practices … Yes, when I’m at home, I’m practicing with my set of V-drum. Because I’m living in an apartment, I don’t have the opportunity, to have an acoustic set at home. So I’m putting on my headphones and start playing. And each day it’s drifferent routine for practicing. I prefer to practice and focus on some fresh rhythms and find new grooves, but most of my practicing time is when I’m practicing with bands that I’m working with. Besides that I try to practice on my style of playing, practice rudiments almost everyday and I try to practice some fresh grooves. About the Tombak. As I said in my previous e-mail, my dad used to play it, but I never tried it that much seriously. Besides drums, I’m playing Daf (frame drum) , Udu drums and Cajon. 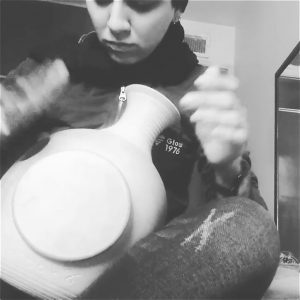 I don’t have any images of me playing these instruments, but I have some videos of me playing Udu and Cajon, which I’ll try to send to you by e-mail. Well, this is it for now. I hope I see some more e-mails from you so soon.